Brown sugar is a sugar product that has molasses added to give both color and flavor. It is commonly used in both baking and cooking, showing up in recipes in various quantities -- everything from fractions of a teaspoon to multiple cups. The nutritional values for brown sugar -- including the calorie count -- vary depending on whether it is packed or unpacked. One cup of packed brown sugar contains 829 calories, while 1 cup of unpacked brown sugar has 547 calories. The amount of calories a food contains represents how much energy it provides your body, according to the Food and Drug Administration. When assessing the nutritional value of brown sugar, remember that while 1 cup is a commonly used measurement in recipes. 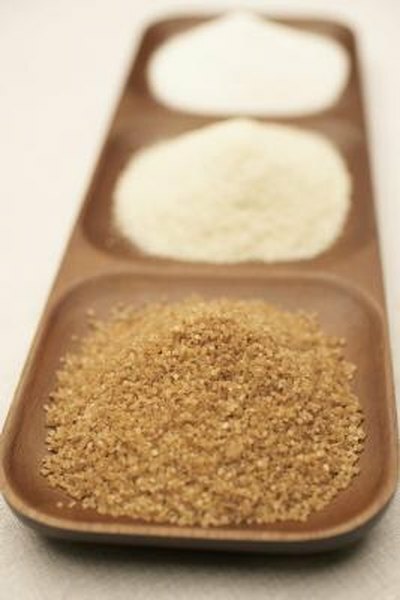 Should you decide to consume raw brown sugar, you would probably eat far less per serving. Brown sugar contains no fat or cholesterol. However, other ingredients in foods prepared with brown sugar may contain fat that will add to your daily fat intake. As a general guideline, your fat intake should be limited to 65 g or less if you eat a 2,000-calorie diet, according to the U.S. Department of Agriculture. Of that fat, only one-third should come from saturated fat. A cup of brown sugar is rich in carbohydrates -- 214 g in 1 cup of the packed sugar and 141 g in a cup of unpacked brown sugar, according to the PeerTrainer website. Virtually all the carbs in brown sugar are in the form of sugars -- 212 g of the 214 g in the packed cup and 140 g of the 141 g in the unpacked cup. Brown sugar does not contain any dietary fiber. Although it is a sweetener, brown sugar does contain a small amount of sodium. One cup of packed brown sugar contains 86 mg of sodium versus 57 g in 1 cup of unpacked brown sugar. Remember, too, that other ingredients in your recipe will add to a food's sodium content. No matter how many calories you eat each day, you should limit your total daily sodium intake to no more than 2,400 mg, the USDA advises. Intakes greater than that total can increase your risk of high blood pressure. Brown sugar does not add to your daily protein intake, but the recipe you prepare with it very well might, because many foods contain at least a small amount of the nutrient. Unlike with other dietary nutrients, the USDA Food Guide Pyramid has not established intake recommendations for protein because of its abundance in the American diet, according to the FDA. Surprising as it seems, brown sugar actually contains several essential vitamins and minerals, according to the PeerTrainer website. One cup of packed born sugar has 33 percent of the recommended daily intake for copper, 23 percent of the recommended intake for iron, 22 percent of the recommended intake for potassium, 19 percent for calcium, 16 percent for magnesium, 5 percent for phosphorus 3 percent for vitamin B6 and zinc and 1 percent for thiamin, niacin and riboflavin. The nutritional values for 1 cup of unpacked brown sugar are as follows: 22 percent for the recommended daily intake for copper, 15 percent for iron, 14 percent for potassium, 12 percent for calcium, 3 percent for phosphorus, 2 percent for vitamin B6 and zinc and 1 percent for thiamin, niacin and riboflavin.